You could choose to serve these two together, as I did, or not, whatever your preference. I enjoyed the combination of the two; the sweet-tart sauce played well with the rich and creamy "cheese", and it looks beautiful. The cheese is soft, reminiscent of the texture of a fresh chevre, with lemon for tartness and miso for a bit of that yeasty "cheesy" quality. This stuff is perfect to spread on gluten-free crackers or celery sticks. 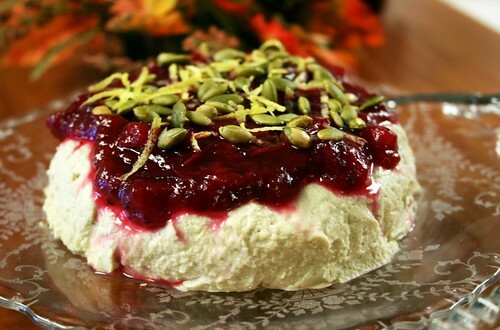 The cranberry sauce is totally amazing, sweet and tart and completely guilt-free. 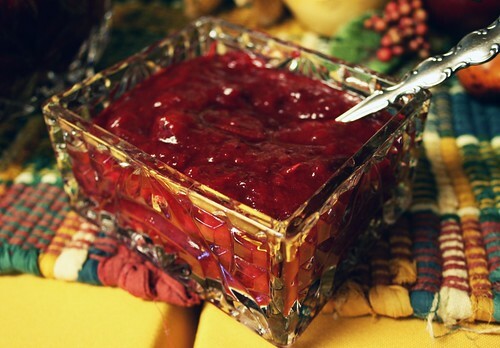 You will have plenty of cranberry sauce leftover, certainly enough to serve over some turkey or on its own. yield: about 1 1/2 cup "cheese"
Place in a food processor or a Vitamix (I used the latter) with remaining ingredients and process until totally smooth, scraping sides as needed. Mixture will be thick, so it may take a bit of patience to get everything nice and smooth. Add water as necessary, only adding enough so mixture can blend - too much will make your cheese runny. Sweet, tart, and brightly flavored, this sauce is delicious cold or warm, and is perfect over the "cheese", stuffing, turkey, or spread on gluten-free muffins. Due to the natural pectin in the apples, the sauce thickens considerably once chilled, and becomes almost as thick as canned whole berry cranberry sauce! This sauce has a special twist: rooibos tea! It adds a lovely subtle flavor that blends well with the sweet apples and tart berries. Heat oven to 350º F. Core apples and chop finely. 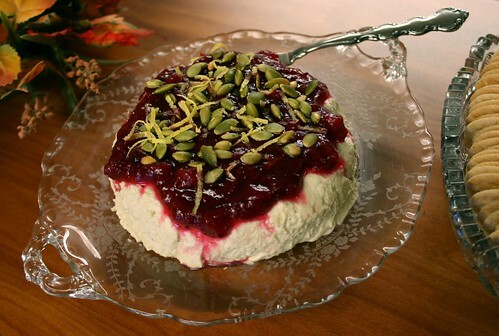 Place in a small oven-proof dish with cranberries and tea, cover, and bake until totally soft, about 50 minutes. Remove from oven. Lightly blend with an immersion blender until partially pureed, leaving some chunks for texture. Add maple syrup and stevia to taste. Serve warm or chilled. Sauce thickens considerably once chilled.